Is the UK gas market being rigged? Allegations of gas market manipulation last week have sparked a political frenzy in the UK. These closely follow allegations two weeks ago that Barclays had manipulated US power prices. Market price manipulation is a sensitive topic against a backdrop of public frustration over rising utility bills and evidence of blatant rigging of LIBOR interest rates by investment banks. Price manipulation is a serious issue for energy markets but it is on a different scale to the LIBOR scandal. Importantly, it could be dealt with relatively easily by implementing clearer regulatory guidelines and using a more effective way to determine price indices. Allegations of gas market manipulation last week have sparked a political frenzy in the UK. These closely follow allegations two weeks ago that Barclays had manipulated US power prices. Market price manipulation is a sensitive topic against a backdrop of public frustration over rising utility bills and evidence of blatant rigging of LIBOR interest rates by investment banks. Price manipulation is a serious issue for energy markets but it is on much smaller scale to the LIBOR price fixing scandal. Importantly, it could be dealt with relatively easily by implementing clearer regulatory guidelines and using a more effective way to determine price indices. The prices of large wholesale gas supply contracts are predominantly indexed to market prices at the UK’s National Balancing Point (NBP) gas hub. This is a good thing for consumers because it increases gas market competitiveness and reduces the risks that energy companies face in buying gas on an oil indexed basis. But it creates an issue as to how the underlying price index is set. 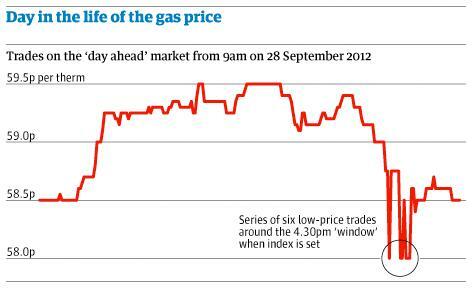 The two most common forms of indexation in the UK gas market are to day-ahead and month-ahead prices. Month-ahead indexation is most commonly linked to the ICE (formally IPE) month-ahead futures contract settlement prices. In addition, each of the price reporting agencies (PRA), Heren, Argus and Platts, publish two sets of price information: end of day price assessments and their own version of specific contract indices (e.g. within day, day-ahead, month ahead etc). Both of these types of price information are used in contract indexation. End of day price assessments are generally dervied from an end of day poll of market participants to determine where the price of specific contracts is trading (including the bid and offer dimension). Whereas the specific contract indices are typically based on the volume weighted average of all prices for trades reported to the PRA on the day. Although it should be noted that the PRAs have no control over what trades are reported to them and typically receive the data towards the end of the trading day. An alternative index calculation methodology is to limit the time over which trades are included to a specific ‘window’ at the end of the trading day. For example, the London Energy Brokers Association (LEBA) publishes two day-ahead index versions (for all major trading hubs with the notable exception of NBP) based on both the weighted average of all trades and the ‘window’ methodology. The price manipulation problem arises when a trader can manipulate a price index with a relatively small trading volume in order to impact the value of wholesale contract positions. The trader may suffer a loss on trades executed to manipulate the price index, but this will be more than offset by a gain in the much larger wholesale contract volumes which are priced off the index. The key to this ‘loss leading’ strategy is taking a leveraged position in an instrument with a value dependent on a price index which can be manipulated. The leverage multiple creates the value (i.e. lose x but gain x × 10). The alleged price manipulation behaviour is shown in Diagram 1, the chart that the Guardian newspaper published last week when it broke the story. It appears that one or more traders have executed sell orders at below market prices around 4.30pm. The price behaviour in the chart is likely to have had a bigger impact on the end of day price assessment and the index ‘window’ methodology, as the impact of the off market trades would have been diluted under the volume weighted average index approach. But rather than focusing on this specific incident, the most important issues are how price manipulation can be addressed and what the scale of the problem is? There are two relatively simple steps that can be taken to address the issue described above. Firstly stronger regulation is required. Neither Ofgem, the UK gas and electricity regulator, or the Financial Services Authority (FSA) have been given clear powers to act on energy price manipulation. Clear guidelines are required on trading practices that are not permitted, with regulators having the power to investigate breaches. Data on trade prices and best market bids and offers is readily available (e.g. through systems such as Trayport) making detection of suspicious activity relatively easy. Breach investigation could also focus on evidence of any leveraged positions that could gain from index manipulation. It is important that new regulatory guidelines are concise, transparent and do not impede commercial confidentiality. Secondly, the price reporters need to develop a more robust index calculation methodology and transparent price assessment process. The ‘point in time’ or ‘window’ methodology to calculate indices should be done away with and averaging approaches broadend to reduce the risk of manipulation. Ultimately the willingness of companies to use an index as a source of price information, or directly in contract indexation, will be driven by the collective trust the market places in it. So it is in the interests of the price reporting agencies to fix this problem. It does not make sense to replace the current indices with a mandated regulatory index. Ultimately the market should dictate standardised contract structures and indices. While price manipulation is a serious offence which impacts the integrity and competitiveness of the wholesale gas market it should be considered in perspective. Firstly it is difficult to manipulate prices for more than small movements over short periods of time, given the UK day-ahead gas market is relatively liquid. Manipulation in the diagram example involves less than a 1% price move that lasts for only a matter of minutes. The impact of this manipulation is magnified for the ‘window’ based methodology to set price indices but even so the scale of manipulation is relatively small. Signing a large volume day-ahead indexed physical trade, but the leverage to any one day’s price fix is diluted by the fact that the day-ahead price will typically be averaged across the month. Creating a leveraged exposure using derivatives (e.g. gas swaps settling against a day-ahead index). However, there is very limited liquidity in the European gas swaps market. Secondly the practice of price manipulation is not, as some political commentators suggest, a cancer across the energy industry. Most energy companies have little to gain from such practices and risk huge reputational damage. While penalties for any traders caught manipulating prices should be severe, it is likely that most traders would be supportive of clearer guidelines to stamp out manipulation and improve price transparency and liquidity. Finally, price manipulation is not a significant factor behind higher utility bills as has been reported in the press. Higher utility bills are predominantly being driven by higher commodity prices (a global issue) and costs associated with the government’s energy policy reforms. Politicians referencing price manipulation are looking for a convenient diversion. In a recent interview with Reuters, the recently retired Patrick Heren (founder of Europe’s most prominent gas price reporting agency) provided his own perspective on price manipulation in the context of the government’s energy policy reforms. “The effects are minuscule compared to the way the government is trying to rig the market”. It is perhaps easier to return fire from the security of retirement, but there is more than an element of truth in his statement.